SOLITINE solid cables are the best twisted-pair cables in the market for transmitting data over local area Networks (LANs). These cables exceed performance requirements specified by the TIA/EIA-568B.2 / TIA/EIA-568C.2 and IEC 60603-7-4 standards. As streaming video and multimedia over LAN are gaining popularity, users demand faster data transmission and reduced waiting time. 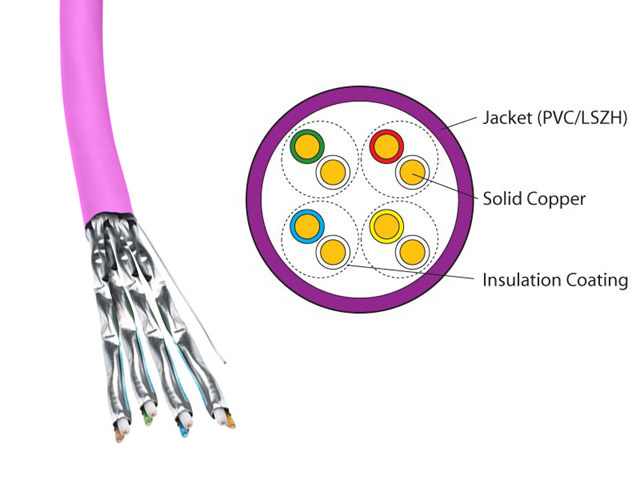 SOLITINE cables are ideal for simple, cost-effective and high-speed transmission performance. They support a higher signal-to-noise ratio, providing better reliability for current applications and higher data rates for future applications. Cat6A cable is specified by TIA/EIA-568C.2 for enhanced performance standards for twisted pair cable systems. It performs at improved specifications, practically in the area of alien crosstalk as compared to category 6. These cables are made of 23 AWG copper wires with a frequency of 500MHz can transmit data at 10 BASE-T, 100BASETX, 1000BASE-T and 10G BASE-T (Gigabit Ethernet). Heat- purpose of the vertical flame testis to screen out flammable wires. It follows the VW-1 (UL) and FT-1 (CSA) standards.